I've had a couple of "misses" when it comes to Korres but on the whole, I like the brand and have recently been adding a tropical hit to the cold, wintery mornings with Korres Guava Shower Gel. I like the presentation of Korres shower gels- each scent features a different design on the bottle, all of which are equally chic and I'd be happy to have on display in my bathroom. The fliptop dispenser means that the packaging is also functional. 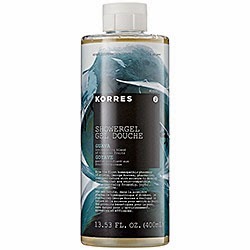 I've previously mentioned my disappointment at the fact that Korres include SLS in their shower gels- some people may not mind this & in fact, may appreciate the lather that it helps to create but personally, I find this cheap detergent to be drying on my skin and would prefer if it were omitted. That aside, I've enjoyed using the shower gel. Korres Guava Shower Gel is one of the most popular products from the brand and it's easy to see why. The shower gel has a pleasant fruity, but not sickly sweet, tropical scent that it would be difficult to find fault with. At £8 for 250ml, Korres Guava Shower Gel may be a more expensive than many body washes but it's still relatively affordable and as I particularly enjoyed the scent, I'd be happy to fork out a few extra pounds for it.